Knife throwing is a popular competition sport and is also used for hunting and tactical applications. Whether you’re an experienced user, or you’re just getting started, we have found some of the best options on the market. Check out our list of the top 10 best throwing knives for 2018. These throwing knives come as a set of three, with a handsome black blade with a black non-slip grip. 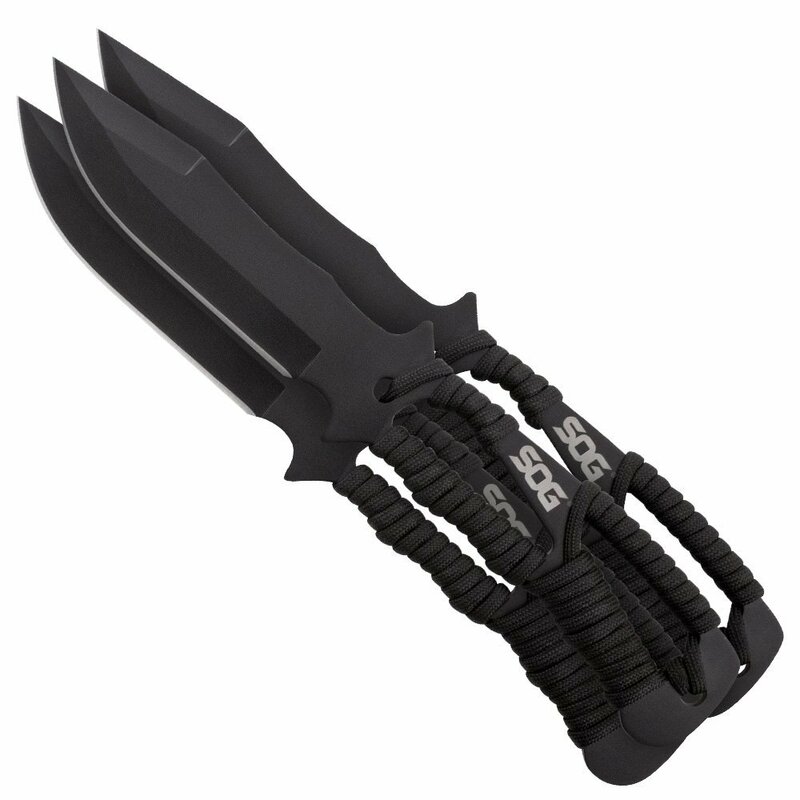 The grips are wrapped in high-tensile cord and the set includes a black nylon sheath. The overall blade length is 8-5/8 inches, with a blade length of 4-1/4 inches. One of the best selling points of these knives is the balance, ensuring even rotation when thrown correctly. The stainless steel blade is appropriate for use beyond throwing. With practice, you can expect a great experience with these knives. This attractive set of three throwing knives is get as a functional set, or simply as display pieces for your collection. The handle has a unique design, with a flat handle and a clean cutout design. The knives weight approximately 3 ounces each, and you have the choice between black blades and colors (a fierce set of yellow, orange, and red). The knives also come with a heavy-duty nylon sheath with a belt loop and three pockets. Consumers highly recommend these as training knives, as they are well balanced and just heavy enough to get productive practice. This set of throwing knives is produced by the reputable and world-renown SOG brand. The handle is glass reinforced and is wrapped with paracord. The blade is a high-quality stainless steel, and the all-black appearance makes it both an attractive knife and a useful knife for throwing and general use; the blade is a straight edge fixed blade. The knives are well balanced and aerodynamic, making them exceptionally good throwing knives. The overall length is 10 inches, but the blade length is 4.4 inches. Included with your knives is a ballistic nylon sheath with a leg or belt attachment. You can’t go wrong with Smith and Wesson. 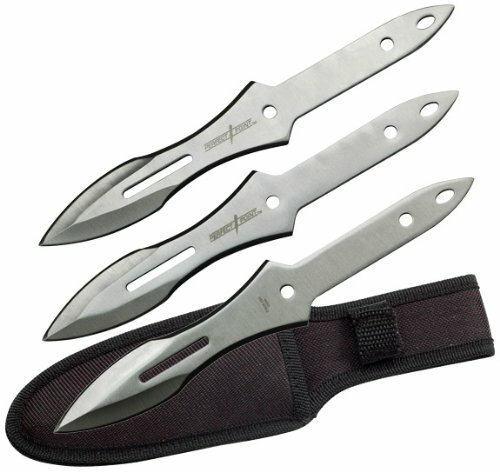 This pack of six throwing knives includes a polyester belt sheath, and the blades are dual-edged spear points. The knives are 8 inches long and are a fantastic option for beginners, as they are well constructed but inexpensive. There are aerodynamic slits cut out of the flat handle, and the knives are easily receptive to sharpening or grinding to suit your throwing style. These well-balanced knives are great as both an introductory set or for experienced users. This traditional-looking design from SOG looks good and performs great. 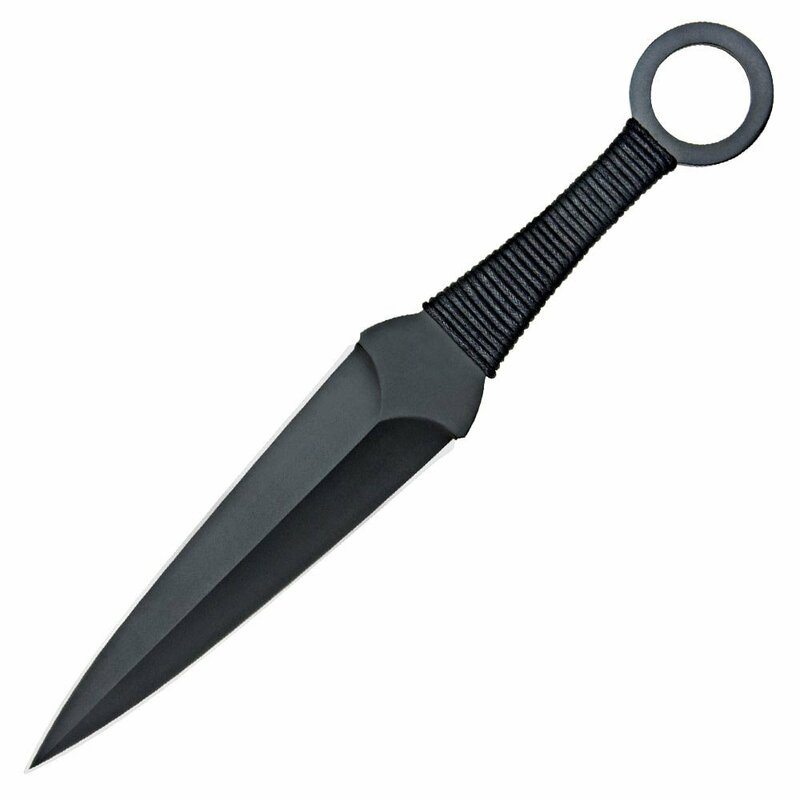 The full tang blade construction is durable and features a dual edge spear point. The steel blade is 2.8 inches and has a satin polished finish, giving it an attractive appearance. The handle is wrapped with a green and tan paracord to provide a secure and comfortable grip, making this an overall excellent choice. 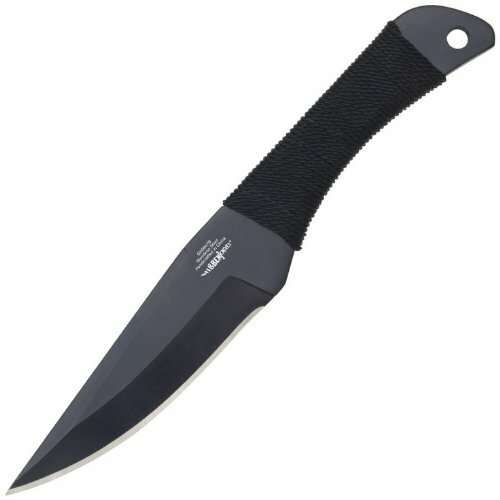 In addition, the knives are relatively heavy at 5.4 ounces, giving you that extra heft that you need for effective use. Another great set by Perfect Point, these knives are 9 inches in length with a full tang construction, dual edge, and a spearhead point. The handles are set to give you the grip you need while protecting your hand, making this a good option for those just starting out with throwing knives. The way the knives are constructed allow you to practice different grips to find what works best for your needs. Even if you’re an experienced user, the balance and weight of these knives make them a great value for the price. You’ll get a set of three knives with a nylon sheath with belt loop at a fantastic value. 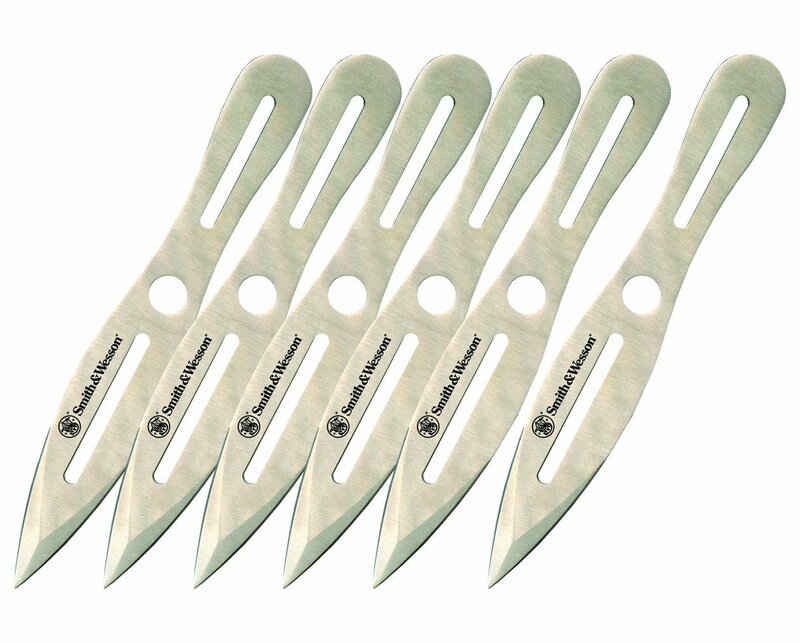 Perfect Point knives are durable and reputable, and you’re guaranteed a well-balanced throw. The stainless steel knives are all black with a spider design, and the handle features a cutout to attach cords or ribbons. The 8-inch knives are built to resist chipping, provided you use them correctly. These heavy performers are a great option if you’re looking for larger knives. 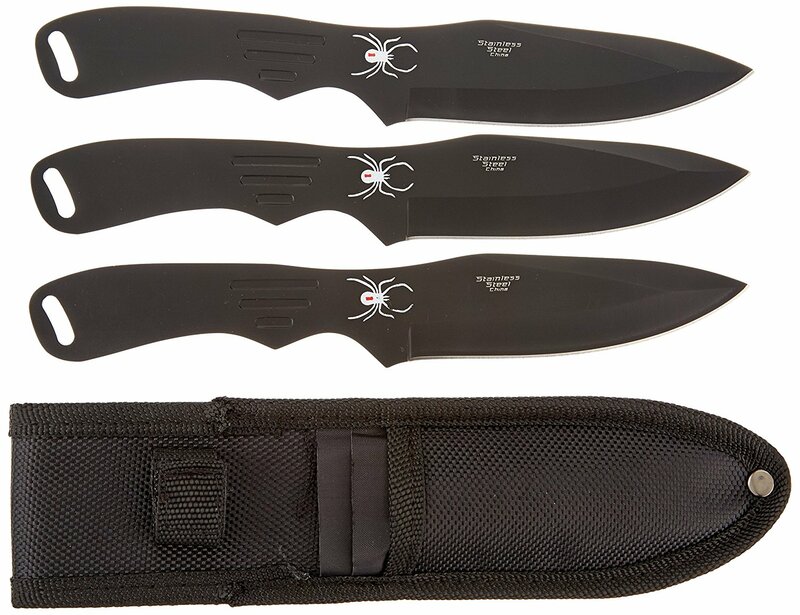 This set of three includes a nylon sheath with both a leg strap and a belt loop, and the 12-inch knives look as good as they perform. The blade is a black and has a dual edge with a cord-wrapped handle. 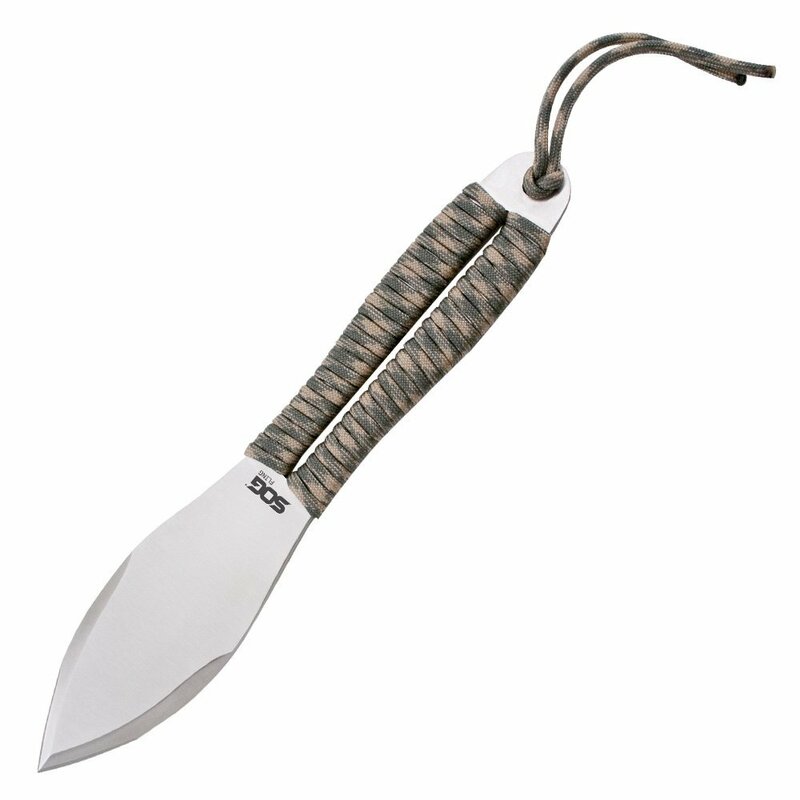 The knives function great as throwing knives, or as sharp daggers, and the end of the handle features a ring great for attaching a lanyard. The handle can easily be re-wrapped to suit your personal grip. This set of small knives is sharp, durable, and ergonomically designed to provide an excellent grip for practice or competition. Even if you’re simply looking for the next piece to your collection, this set will fit the bill. The full tang construction (made as a whole piece) will ensure a long life for these knives, given proper care. The knives are 8-1/2 inches in length, and are great if you prefer a spinning technique. In addition, the set includes a leather sheath. United Cutlery is known for producing quality throwing knives, and this 12-inch competition set is no exception. The blades are particularly good for the spin technique, as the ergonomically shaped handle encourages that method. They are relatively heavy, making this a better choice for experienced users. In addition, you’ll love the thickness of the blade, as you can be assured you’re getting a well-made product. In short, you have a lot of options for throwing knives, including blade style, handle style, and length and weight. Consider your personal needs and throwing style when looking for your next (or first) set of throwing knives.